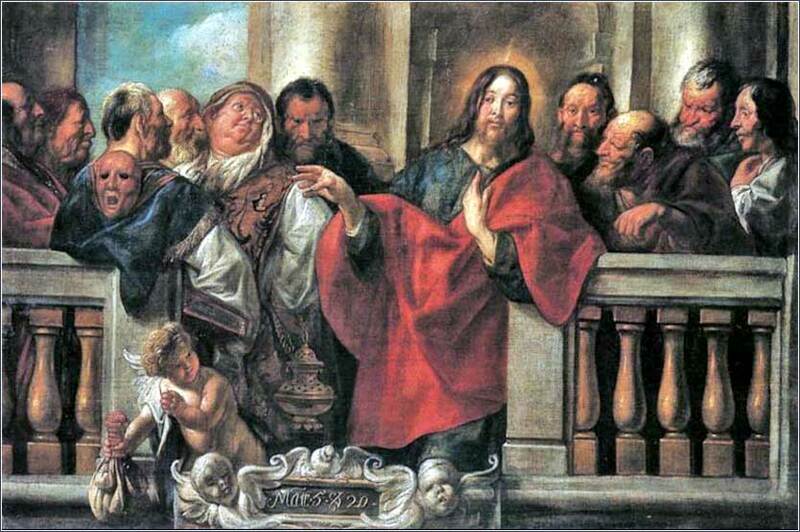 Jesus and the Pharisees by Jacob Jordaens, ca. 1640. We can see a lot of Rubens in the realistic depiction of the figures, although they are clearly contemporary Flemish rather than ancient Hebrews. Notice the mask hanging on the back of one Pharisee, showing hypocrisy. Holy God, as I face another day, I know I am going to face many challenges: to my faith, to my patience, to my love for others. I am going to have constant temptations to lapse into sin. Come to me now, Lord, and stay with me all day. Let your Spirit encompass my mind. Let me know your presence. Steer my hand, direct my words, guide my thoughts in everything I think and say and do. I resolve to live this day as a beacon of your glory, the best I can, with your help. I commit myself to give this day to you. In the name of Christ, be with me and help me. You, Lord, through your works have revealed the everlasting structure of the world. You, Lord, created the earth. You are faithful throughout all generations, righteous in your judgments, marvelous in strength and majesty, wise in creating and prudent in establishing what exists, good in all that is observed and faithful to those who trust in you, merciful and compassionate; forgive me my sins and my injustices, my transgressions and my shortcomings. Do not take into account every sin of your servant, but cleanse me with the cleansing of your truth, and direct my steps to walk in holiness and righteousness and purity of heart, and to do what is good and pleasing in your sight and in the sight of my rulers. Yes, Lord, let your face shine upon all your servants in peace for our good, that we may be sheltered by your mighty hand and delivered from every sin by your uplifted arm; deliver us as well from those who hate us unjustly. Give harmony and peace to me and to all who dwell on the earth, just as you did to our fathers when they reverently called upon you in faith and trust, that we may be saved, while we render obedience to your almighty and most excellent name, and give harmony and peace to our rulers and governors on earth. Translated from a letter, 96 A.D.
Matthew (the only evangelist to recount this parable) does not identify Jesus' audience clearly. In the preceding verses, he was talking with a group of priests and scribes who were plotting his death, and it seems likely that it is they who answer the question wrong. Or, it might simply be a group of people surrounding him in the Temple. But the answer identifies them as hypocrites, and even worse, intentional hypocrites. They choose the child who shows formal respect to his father's face over the one who actually does what his father asks him. They are so puffed-up that they would rather hear a lie followed by wrongful conduct, than be insulted by someone who later repents and does the right thing.. Neither son represents an ideal, of course. The ideal son would simply say “yes, sir” and then go to work. But anyone who values real goodness more than his own dignity might actually prefer the son who said “no” and then did not go to work, since a broken promise is generally worse than no promise. The parable reminds us of a very early teaching, in the Sermon on the Mount: “Not everyone who says to me, ‘Lord, Lord,’ will enter the kingdom of heaven, but the one who does the will of my Father who is in heaven.” (Matthew 7:21) Christ does not demand perfect obedience of us; if we are sincere in our repentence and belief when we are baptized, Christ will always be willing to forgive our sins. In fact, there is a wide-ranging theological debate as to whether a person who has received the Holy Spirit can ever be disenfranchised, whether it is even possible for such a person to go to lose his place in heaven altogether. However — and this is a big however — speaking the words is not enough to save us. Sincerity of belief and true repentence is required. One may be dunked in a river by a preacher, or sprinkled by a priest, with no effect on one's soul, for the physical act and words are only symbolic; it is what lies in one's heart that opens our souls to receive the Spirit. Temptation of Christ (detail) from the Hunterian Psalter, English ca. 1170. 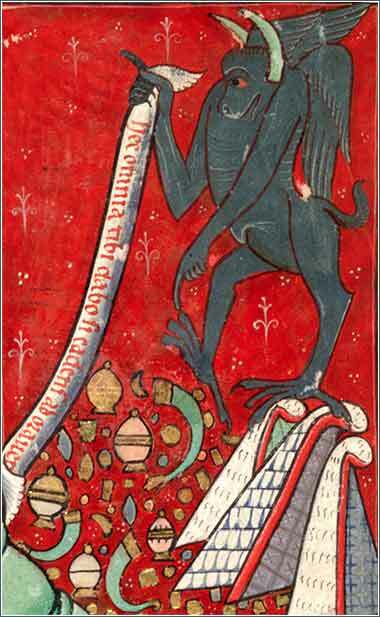 This detail of Satan is a wonderful early devil depiction. He is standing on top of the Temple, showing Jesus the riches of the world (Matthew 4:8-10) It is very reminiscent of the lesson today; we can almost feel him urging us to choose the things of this world. Ephesians 6:10-12 (ESV): Be strong in the Lord and in the strength of his might. Put on the whole armor of God, that you may be able to stand against the schemes of the devil. For we do not wrestle against flesh and blood, but against the rulers, against the authorities, against the cosmic powers over this present darkness, against the spiritual forces of evil in the heavenly places.